I learned more about living a good life in one afternoon with him than all semester at college. It was 1970. I was home from college for Christmas vacation when Dad asked if I’d like to go with him for the afternoon. He had food baskets from the church to deliver to several families in the area. It was a dry cold day in far northern Maine, and snow was in the forecast. It wasn’t snowing yet, and even if it had been, Dad would still have gone out to deliver those baskets. He knew about snow and about driving in it, and he knew about responsibility. He had baskets to deliver. 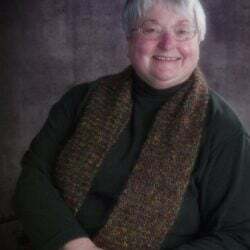 Susan Dahlgren Daigneault, author of “In the Shadow of a Mountain,” is a resident of South Berwick. Filling the entire back seat of Dad’s Chevrolet, the baskets were actually cardboard boxes, each filled with a frozen turkey, cans of vegetables, bread, a bag of Aroostook County potatoes and a pumpkin pie. I learned more about the essentials of living a good life that afternoon with my dad than I had learned all semester in college. Although college broadened and deepened my understanding of many academic disciplines, it was always Dad who taught me the essentials and reminded me of what mattered in the world. Giving to others was important. Even if you had little to give in a material sense, you could give of yourself. I thought of Dad this afternoon as I roamed our backyard, clippers in hand, looking for fir tips to clip for a Christmas wreath. How many to pick? One hundred? Two hundred? Best to clip too many and have enough than have to come back out for more when the temperature is even more frigid than today. Finished with clipping, I returned to our garage with two bags full of tips. Using a circular metal frame and an oversized red bow saved from last year’s wreath and thin wire, I picked up trios of tips, placed them on the frame and wrapped wire around the base of the tips. As I worked my way around the frame, I thought about the many Maine wreaths from the Worcester Wreath Co. that recently made the long journey to Arlington National Cemetery, just the other side of the nation’s capital. Those wreaths are decorating the simple white stones of the many veterans who served our country. This wreath that I am making will also be going to a veteran. It will travel with me to the frozen fields of Aroostook County, where I will place it in front of my dad’s grave at the Pierce Cemetery in Mars Hill.